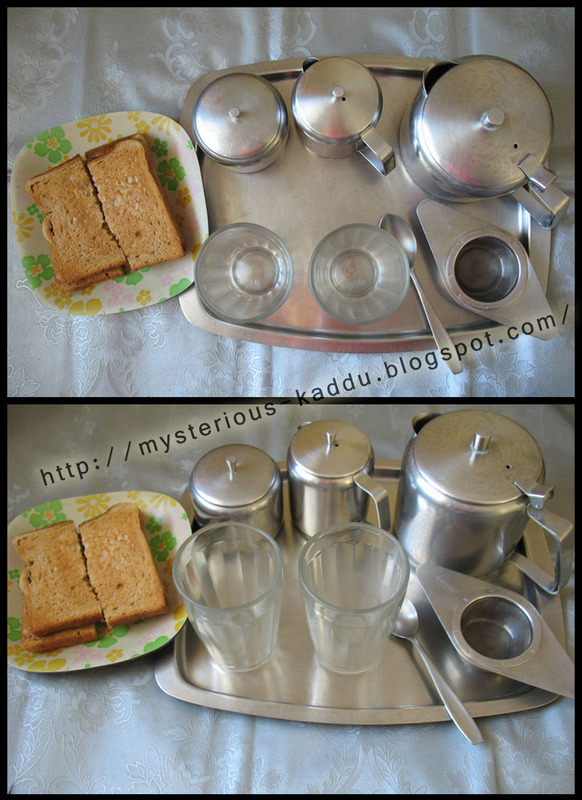 Morning tea and slices of buttered toast... this has been our daily morning ritual for as far back as I can remember! This stainless-steel tea-set has apparently been in my family longer than me! LOL! My mom, dad, sis & I... none of us ever liked the Indian milky tea. We always preferred liquor tea, with very little milk. (Little, as in like 2 tsp milk in that full glass of tea liquor!) Very rarely, we find that we're out of bread in the morning. Then the toast-tray is replaced with a small plate of marie biscuits instead. When sis & I were in school, we naturally weren't allowed to start our day with tea, but even then, this tea-tray started the day for mom-dad! We even had tea-cozies for the tea-pot back in Kanpur, 'coz we used to have extreme winters there, and the tea got cold before we could pour it out into the glasses! This is my second post for 2013 May Photo A Day Challenge. Link to the previous post: "Photo A Day - I Bought This!" I dont know what to say, Kadambari. Wish I could hug you now! I like to have some lemon juice in my tea if it's without milk. But yeah, I prefer very little sugar too. That steel set looks so enticing! It has that old stuff charm to it. Lovely post! I am a tea person and I love your unique tea set. Such a lovely set and ur ritual reminded me of my old days. When we were kids my parents used to have tea in a similar manner. We kids though didn't drink tea but we wud join them so that we could talk before the day began! Thanks for liking the tea set! Where did you spend your childhood? Are you parents connected to SBI in any way? When my sis and I were kids, we used to get very little tea in small 'katoris', so we could have biscuits or bread dipped in tea!